The meaning and function of the image has been evolving over all time. This has been separated from mimesis and given greater openness and an emergent meaning to be adapted to the fluxes that characterize our contemporary society. 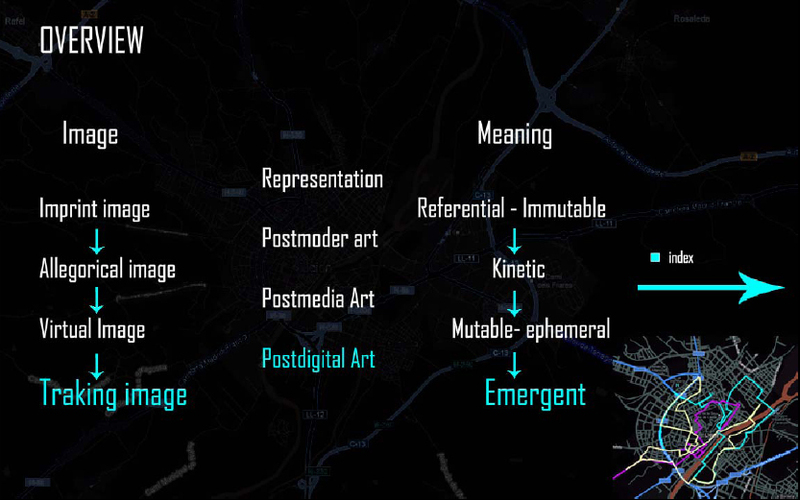 Throughout this process Art has lost the primacy and exclusivity of the image to share it with science and its visualization procedures and with a social function, now disseminated trough social networks. This article points out the decisive moments – and illustrates them with examples – through the evolution from the image in Postmodernity to the open and co-participated meaning of the Postmedia age image, and the new relation with the real world that characterizes the image of the Postdigital situation. Finally, we propose that the Postdigital Condition, related to new advances such as augmented reality (AR), geopositioning devices and ubiquitous informatics, is making the appearance of a new image type possible, here called Tracking-Image. This Tracking-Image is self-generated with data, from the flux of inputs generated in physical space and registered by networked users and sensors, becoming the protagonist of a new encounter with the physical fluid reality that characterizes the Postdigital situation.